We are pleased to market this property through the prestigious Sotheby’s brand. Their reputation for exceptional service, marketing, and international reach were the drivers for our listing decision. 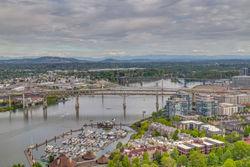 Cascade Sotheby’s International Realty has been chosen to list the prestigious KOIN Center penthouse owned by the late Earl M. Chiles, grandson of renown supermarket pioneer Fred Meyer. The 5,681 square foot penthouse spans three-fourths of the KOIN Tower’s 30th floor and boasts a nearly 360-degree view of the Portland landscape and Mount Hood. Among the tallest buildings in Portland, the KOIN Center is home not only to its broadcast media tenant but Fountain Plaza, a group of exclusive condominiums occupying the top eleven floors of the building. Few Portland icons offer quite the history and esteem as this superstructure and its most distinguished double unit: The Plaza Fountain penthouse. The Chiles penthouse is currently on the market and lists at $3.29 million. The Oregon real estate powerhouse surpassed $1 billion in closed real estate sales in 2016. The company joins an elite 25 Sotheby’s International Realty® franchises in the U.S. in the billion-dollar volume category and is one of the top 20 largest franchises in closed sales revenue in the entire Sotheby’s International Realty global realty network. A lover of the Pacific Northwest and all things quality, local Portland businessman and philanthropist Chiles bought the north half of the penthouse as a double unit while the skyscraper was still under construction in the early 1980s. Chiles later purchased the southwest corner unit as guest and entertaining quarters, creating more than 5,000 square feet of living space across five bedrooms and five bathrooms. The double unit served as Chiles’ primary home for more than thirty years as he carried out philanthropic work. Chiles was the son of Virginia (Hughes) and Earle A. Chiles, the latter of whom was the stepson of Fred Meyer. The younger Earle ran the Chiles Foundation, a charitable organization founded by his father, from 1968 until his death in 2016. Through scholarships, grants to nonprofit organizations and significant contributions to such institutions as the University of Portland, Portland State University and Providence Health & Services, the foundation has benefited thousands of Oregonians—primarily in the fields of higher education and medical research. In carrying on the family tradition of knowledge inquiry and philanthropy, Chiles was instrumental in creating the Earle A. Chiles Research Institute at Providence Cancer Center, named in honor of his father. Proceeds from the sale of the Fountain Plaza penthouse will go to the Foundation to continue the legacy. Chiles’ affinity for quality European design is evident in every aspect of the penthouse. From the blonde and white onyx that lines the master bathroom to the leather tile floors that lead to the wet bar with a French Le Cruvinet wine system, the finishes are thoughtful and of the highest quality. In addition to two wet bars, the penthouse features two top-of-the-line kitchens, recently renovated with nods to design details popular in the 1980s. Three separate living areas—one lined completely in grass cloth—are all ideal entertaining spaces, complete with breathtaking views. The more European traditional style double unit and the more contemporary modern unit are linked, but are also accessible separately through the semi-private hallway that houses the elevator. Other touches include cherry herringbone floors in the main dining room, an onyx pedestal sink with gold plated finishes in the powder room and cedar-lined closets. Vintage components include the original sound, security and lighting systems with room-by-room controls, each top-of-the-line for their time. A Habitat brand, climate-controlled master bath adds another element of retro chic character. A prospective buyer may keep these accents, or choose to renovate and open the double and single units into one open concept design scheme. Interested parties should contact Cascade Sotheby’s International Realty broker, Alicia Selliken, at 971-570-4403. Cascadesothebysrealty.com, which will launch a fully integrated digital platform from lead generation, social media management, CRM and a responsive website connecting to the Sotheby’s International Realty global network.